I would have to say that pound cake is definitely one of my favorite desserts to eat. 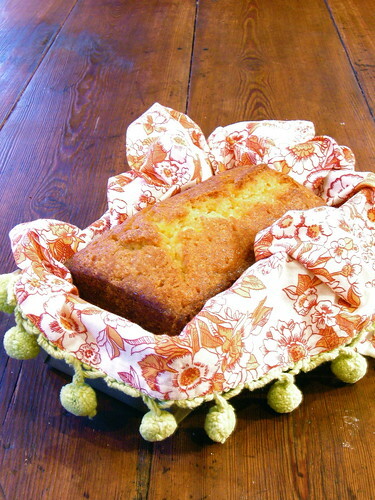 I love the dense texture of pound cake and the subtle sweetness, which never fails to put a smile on my face. Although I have not had extreme success with making it in the past, this was totally different. A woman at my church makes an incredible almond pound cake on our rotation for coffee hour, and I would love the recipe; until I do get it, this recipe will more than suffice. Because I had no oranges, I had to run out to Burbage's to pick a few up. While I was out, I left the butter and the eggs on the counter to come to room temperature. The butter was soft and moveable and the eggs were no longer cold by the time I got back. Although it may not be the almond cake that first made me fall in love with pound cake, it is definitely in the running for my favorite cake. This would be perfect at breakfast time, perhaps even with a glass of juice or a warm cup of coffee. Whatever you do, make this cake! Preheat oven to 350. Butter and flour a 9-inch loaf pan. Cream butter, sugar, and orange zest until light and fluffy. Add tablespoon of orange juice. Beat in eggs one at a time. Whisk flour, baking powder, and salt in a separate bowl. Stir dry ingredients into butter mixture. Transfer batter to loaf pan and bake for 1 hour. Let cool for 15 minutes. Whisk together orange juice and sugar. Brush warm cake with orange juice glaze.